This morning I broke from what has now become my normal routine and headed out to the potager! Here in the potager, is where I can usually find them. I have been so busy with the upcoming event in Tipton...I have hardly had anytime to spend out here . The event will still be held each year in July and still be quite wonderful...I just won't producing it any longer. My Husband has asked me to take a break. And smell the flowers, pick a few and bring them in. It's time to regroup and refocus on what's next. Wait on the Lord the show me His plan...not mine. It's time to Tinker for a bit! And finish our home's renovation! We are now working on 6 YEARS! Time is just not something either myself or hubby have much of . So, I am going to take at least one year to do just that. As I walked around my garden this morning, I did take a moment to stop and pick a few flowers for my dining room...which is still not complete, but were getting there! And soon, I will have the time to work on it. I knew it was time to take a break, and time to share this news with you. It was something I have been putting off. By sharing this news... it becomes real to me. Something I now am committed to, which is what my family is wanting me to do. I still have a busy day ahead of me. Thank you so much for stopping by! Your home and garden are so beautiful this morning! I have to be honest...I've always wondered how you did do all you do. I sometimes get worn out just reading about all your irons in the fire and leave with a feeling of amazement at you and your seemingly boundless energy. The thing that impresses me most about you is not the amount of work you put out (which btw is staggering), but the care you put in every project big or small. From where I'm sitting, nothing is beneath you nor too piddly not to deserve your best. You are a kind, nurturing soul and I am so looking forward to the day we meet face to face, because I truly believe that is how you feel and treat people. I want to grow to be as gigantly gorgeous as your garden from the seeds you sow. I don't blame your family one bit. I would want to spend as much time with you as I could too! P.S. Just throw up some photos every now and then to keep me on my toes...'kay? I know this was a hard decision and a simple one. You know where your priorities lie, and you also know how quickly life can pass by and family is everything. My heart is with your heart... where ever it takes us. Sending love and blessings to you this morning. Your potager looks like a beautiful place to start the day. I know it must have been a difficult decision to make, but I'm so happy that you have chosen to take this much needed break. Now you can do the things you and your husband want to do. Blessings to you on your new direction. I agree follow your heart.God has plans for you and he will show you the way! 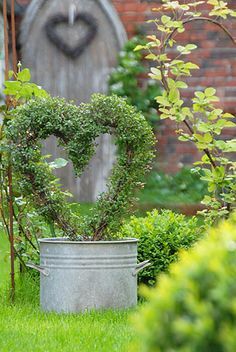 I can't imagine working on a home project for so long.I am sure you are looking forward to the finish.Your garden is lovely.Your photos are inspiring me for my own yard.We have a blank slate still deciding what to do.But you have given me some ideas. Sometimes, that is just what we have to do...take a break and let the Lord direct. I love your potager...it looks so peaceful. Enjoy. good for you!!! life is short take time to just sit and enjoy! It's nice to take a little time for yourself and for your family - especially since you have been doing oh so much - how do you do it?!?! And I just LOVE your potager - wish I had that much of a green thumb! There is so much I want to do too...just so little time! Enjoy your time with your hubby and can I just say that I just adore your hydrangeas?!?! :) Take care!!! Enjoy your time after the show. I always feel that when one door closes another opens! Thank you for sharing the news with us. I know it was a very difficult decision for you (and your family). You have produced and nurtured what has become a very successful event. Congratulations on the success, your decision, everything! Enjoy your family, home and glorious garden!! Hi Donna, you have clearly made a difficult decision, but how wonderful to look ahead to creative projects at home - which looks gorgeous by the way! - and to have a little time to enjoy your garden which only gets more beautiful with each post you share. Wishing you a wonderful summer and much produce from the potager! I think your dining room looks perfect. My own dining room needs attention. Like things on the wall and a chandelier hung and slips for the chairs. Every room in my house needs things done to it. But then what is the fun of a house where all the projects are done? How beautiful this time will be for you -- when the Lord calls you to something, you know it will be an exciting adventure! Enjoy the freedom from deadlines and time constraints and more time with your family! I do hope that you still have time to do this blog. I so love coming here. Your photos grace the internet landscape with such beauty and respite from anxious thoughts and chaos. It's such a lovely retreat for the mind. Thank goodness you are human! If I had you beautiful home, cottage and garden you'd never get me to leave. I'm of the opinion no matter what we do or how much we love it, there comes a time to make changes. I recently told my sister about a big change I made, regarding my job, and she said its good to go out on a high note. I agree, but it's still a little sad letting some things go. Seeing someone step right into my shoes was a little hard. You're still going to be a busy lady. I'm happy you'll have more time to enjoy your blessings. 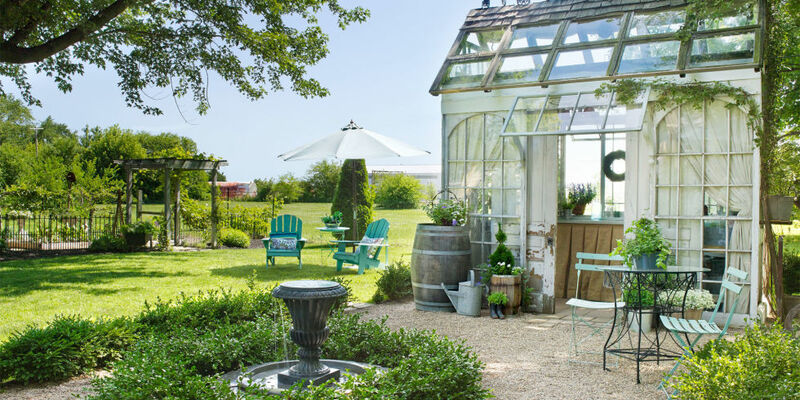 Your potager, greenhouse, and home are all so beautifully designed and lovingly kept. Everything you and your husband create is so beautiful! I've been in your shoes before, where I've been consumed with my own projects and had to stop in order to offer more of myself and my time for my family's needs. If it's too painful to let go of, perhaps praying for God to take away your desire is a possibility. I remember one day loving my Etsy and the next week having no desire at all to make flowers anymore, and I truly believe God helped me to overcome the emotional pain of letting it go. Now, God has filled my life with so many new things--very fulfilling things, and I believe that my life is so much simpler and enjoyable. Another thing to consider is how blessed you are to have a husband who wants to spend more time with you. Isn't that wonderful?! I hope you both have a Happy July 4th! I completely understand about slowing down. I have to remind myself of that constantly. I DON'T want to miss my girls growing up. I'm so glad that you will have time to "stop!" I also appreciate all you are doing this year for the French Market...THANK YOU! I know it will be great and can't wait!! !